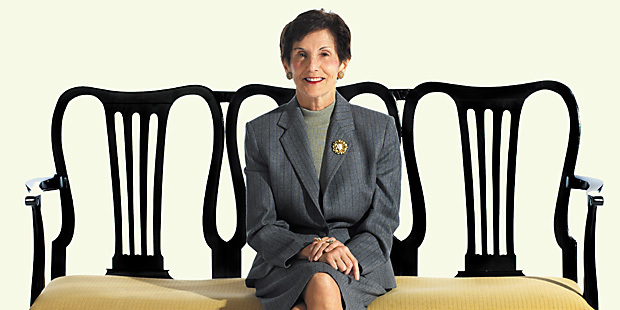 An authority on international law, trustee Rita Hauser ’59 endows the Hauser Global Law School Program with her husband, Gustave (LL.M. ’57). She championed the LL.M. program in Singapore, and convened faculty and trustees for a democracy and terrorism conference (see page 139) in July. This adviser to presidents and prime ministers spoke candidly with senior writer Graham Reed. You are a prominent New York Republican, as was your father. He was very active in the party and close to Governors Dewey and Rockefeller. People ask me, “Why are you Republican?” I tell them New York was different when I was coming of age. I am a Rockefeller Republican. Did he encourage your interest in politics? He thought women should be schoolteachers. So, were you a rebellious child? I wouldn’t call it rebellious, but I had a very strong personality. I still do. If there was something I wanted, I marshaled the arguments and proceeded to figure out how to get it. I never gave up—persistence! How did you develop your international focus? My forte has always been languages. I studied Latin, French, German and Italian, and was particularly interested in the French Revolution. I didn’t know people had the power to change things like that. When I earned my law degree in the U.S., I went to France for a law degree in order to practice in both places. Most big law firms didn’t hire women, and if they did, they put us in estates and trusts. My friends Ruth Bader Ginsburg and Sandra Day O’Connor had similar experiences. I was even more peculiar because I wanted to do international work, which meant travel. I remember one senior fuddy-duddy at a major law firm telling me, “Women can’t travel alone.” I’m not talking about prehistoric times, either. Do you think that a cross-cultural legal education is essential for law students? We have a global economy, and lawyers represent corporations that are international in nature. We conceived of the Hauser Scholars Program to be a sort of Rhodes Scholarship for lawyers. International students, already experts in their fields, receive an LL.M., while our students are exposed to people from other systems. The faculty and students in the Singapore dual-degree program come from places like India, China, Australia and Canada. You served on the President’s Foreign Intelligence Advisory Board under Brent Scowcroft from 2001 to 2004. What do you think is a plausible outcome from our intervention in Iraq? I see no plausible end since we are in the middle of a civil war. I never supported the war and I urged that on everybody, from the president down. I subscribe to the view that we should withdraw combat troops from the major cities to just across the borders. The Sunni and Shia will have to fight it out and reach a political accommodation. I don’t see any point to further U.S. engagement. The underlying political issues are not being addressed and we will have more casualties. In 2001, your name was in the hopper for U.S. ambassador to the U.N. Do you ever wonder how things might be different? I would have resigned over the Iraq war. We are the most powerful player in the U.N., and when something is important to our national interests, we have to get it by bringing along other nations. That means compromise. We shouldn’t just expect others to vote with us, which is what happened with the second resolution for the Iraq war. We were twisting arms and bribing nations and it didn’t work. You and your husband are both very busy people. How do you spend your free time? We have two great loves. The first is hiking. In New York, we walk everywhere. The other is music. I am on the Lincoln Center board, and was on the N.Y. Philharmonic board for decades. Who is harder to deal with, artists or politicians? The common denominator is that they both have very large egos. My father taught me that when successful politicians look in the mirror, they say, “Me, me, me!” If you don’t believe in “me, me, me,” then you don’t have the juice to be a politician. What is the best lesson you taught your own children? That everybody slips on a banana peel sooner or later. How you get up, brush off your behind and get on with things is the great test in life. Also, if you have offended anyone, apologize. You may find they’ll be there when you’ve slipped. Have you given that same advice to politicians? Yes. But politicians rarely apologize.